I've had a lot of messages asking about the amps Kirk Fletcher was using on his recent UK shows. On both shows he had two amps running with a Radial Hotshot passive A/B/Both box. This allowed us to connect to both amps without any ground loop induced noise. When using this box it is crucial to make sure the guitar is buffered or there will be a very noticeable (read unusable) loss of top end on the 'B' output when it is isolated. Kirk has a Boss DD pedal on his board which fulfilled this requirement. 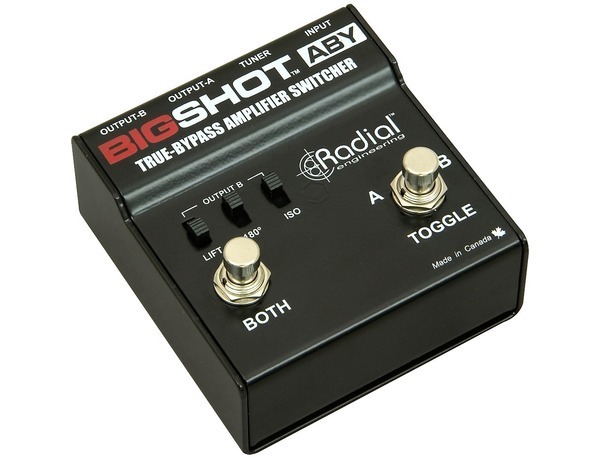 Any Boss pedal will buffer the signal even in bypass. At both shows Kirk used his 633 ‘KF30’ tweed combo which is based on a mid 50’s Fender Pro Amp. The original used a 15” speaker, Kirk’s uses a 12” Celestion Alnico Gold and I squeezed the amp complete with oversized transformers into an off-the-shelf Tweed Deluxe chassis. The feature set is two inputs, Bright and Normal, each with it’s own Volume control, then Treble, Bass & Presence. I also added a solid state/tube rectifier switch which drops the output power from around 35 watts to 28 watts and adds more compression to the tone. Kirk was using the solid state setting and the Normal input on the amp. At the Borderline show the second amp was a Drive King 50 Head feeding a 2x12 open backed cabinet loaded with one Celestion Alnico Gold and one Celestion G12-75H Creamback wired in series. The Drive King was set to use the clean channel with the Headroom set to position 3 - so around 25 watts. On stage there was an equal mix of both amps. At the Bristol Jazz & Blues Festival show we used the same rig but experimented using a Classic 45 head with the 2x12 cab. Alas during soundcheck Kirk was asked by the sound engineer to reduce his stage volume so we ended up using just the combo. When using two or more amp/cabs it’s important to make sure the amps are working together and in phase. The Radial box has a phase reversal switch but it’s also important to get the speakers aligned in the same plane, particularly if they are place close together. Try and line up the cabinets as if the speakers were all on one baffle. To establish the correct position of the phase switch position yourself in front of both cabs and play a muted note on the low E string using the neck pickup with the tone control turned down and listen to how much low end thump there is. Then flick the Phase switch and listen again. the setting that produces the most bass is the most in phase.